Swansea City winger Wayne Routledge says his team-mate Leon Britton deserved to make Roy Hodgson's England World Cup squad. 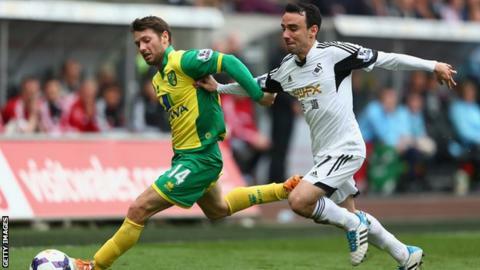 Britton, 31, has played for Swansea in every division of the Football League and in English football's top-flight. Routledge says the midfielder Is good enough to take on the world's best in June. "For me Leon Britton's one of the best midfielders in the Premier League," said Routledge. Other clubs: West Ham (trainee) and Sheffield United. Britton joined the Swans initially on loan from the Hammers in December 2002. The club were struggling in the bottom tier of the Football League at the time. Apart from a brief spell at the Blades, Britton has made 491 appearances for the Welsh club scoring 17 goals in all competitions. "His stats. What he does for the back four. His passing ability, how he reads the game, I think the only thing that goes against him is his age. "But he can still do it in the Premier League and he's still doing it now. So he's definitely be in my thoughts [for the World Cup]. "Leon is very, very underrated in my opinion." Swansea City boss Garry Monk says in-form Routledge, should also go to the tournament, which starts in June. The 29-year-old has been involved in every single match since Monk took over as head coach in February. But the former Crystal Palace, Newcastle United and Queens Park Rangers player says he is not thinking about this summer's tournament in Brazil. "I haven't even looked that far forward," said Routledge. "I take most things a day at a time and game after game and see where it takes me." Routledge scored in Swansea's 3-0 win against Norwich, a result that moved them seven points clear of the Premier League relegation zone to 13th in the table. On Saturday they travel to 14th placed Hull City, who are only below them on goal difference. Despite the gap between them and the bottom three, the Swansea winger says the club are not safe yet and are looking to get a win against Hull. "We are not away from it," said Routledge. "The last week has given us a good platform to build on. "We go into the game at Hull with a bit more confidence than we did before. Hopefully we'll put on a performance and get the three points."